Robert Swarthout Sr. was the owner of a Texaco gas station when he was approached by a local bus company that wanted to park its vehicles in the area adjacent to the station. In exchange, the company would buy its gas from the station. Swarthout agreed, which led to the next stage in his business’ evolution. In 1974 the operation went strictly to charters. Five years later, Robert Jr. joined the company. Fifteen years after that, Robert Sr. passed away and Robert Jr. became president. 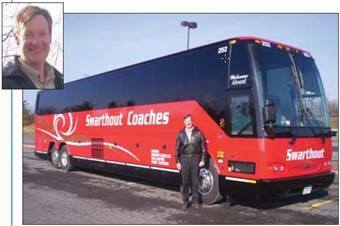 It was his father’s gift for taking advantage of rare opportunities when they presented themselves that enabled the company to make the transition from gas station to school bus operation to what it is today — Swarthout Coaches and Tours. The Ithaca, N.Y.-based motorcoach company currently provides transportation services primarily to Cornell University, Ithaca College and SUNY Courtland. To accommodate student and business cultures that favor luxuriating in the finer things in life, Swarthout Coaches and Tours recently purchased a 56-passenger, 45-foot Prevost motorcoach equipped with flat-screen TV, sound system and reclining seats. The company will acquire a second such vehicle early next year. Swarthout’s motorcoaches are equipped with some of the most advanced safety solutions on the market today. Drive Cam, SmarTire and the Kidde Dual Spectrum fire-suppression and detection system can all be found on the operation’s vehicles. The systems work synergistically to keep the operation running smoothly by preventing a wide range of mechanical and driver behavioral problems. DriveCam, for example, is an event-triggered video recording system designed to teach drivers to monitor their conduct on the road, as well as safeguard the operator against false liability claims. The other solutions are aimed at preserving vehicle integrity, thereby cutting down on unnecessary costs related to fuel and unscheduled downtime. “We always try for better utilization of equipment,” Swarthout says.